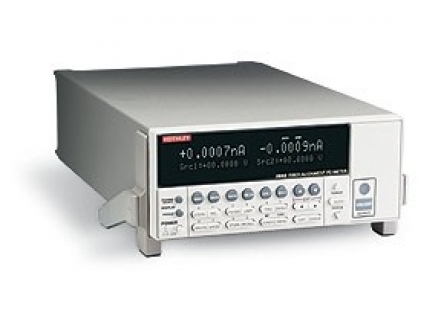 The Model 2502 Dual-Channel Picoammeter provides two independent picoammeter-voltage source channels for a wide range of low level measurement applications including laser diode testing. The Model 2502 is also designed to increase the throughput of Keithley's LIV (lightcurrent- voltage) test system for production testing of laser diode modules (LDMs). Developed in close cooperation with leading manufacturers of LDMs for fiberoptic telecommunication networks, this dual-channel instrument has features that make it easy to synchronize with other system elements for tight control over optical power measurements. The Model 2502 features a high speed analog output that allows using the LIV test system at the fiber alignment stage of the LDM manufacturing process. Through the use of buffer memory and a Trigger Link interface that's unique to Keithley instruments, the Model 2502 can offer the fastest throughput available today for LIV testing of laser diode modules. These instruments are ruggedly engineered to meet the reliability and repeatability demands of continuous operation in round-the-clock production environments.